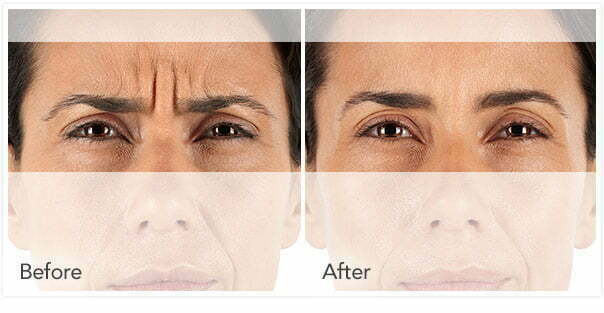 XEOMIN is a BOTOX alternative for treating signs of aging in the brow area. XEOMIN and other botulinum toxin injectables made up over 60% of total injections performed in 2013. Botulinum toxin injections should halt wrinkle-causing muscle movement without "freezing" the face. $10 to $16 per unit; no downtime is required. Day to day, the muscles of your face are constantly exercised as you outwardly express your emotions—from laughter to concern, your expressions are part of what make you unique. Unfortunately, these muscle contractions can start to take a toll on our appearance as we age. Glabellar lines often develop between the eyebrows, creating pesky “11” creases that stick around regardless of what you’re feeling. Not only do these lines age the face, they also give the appearance of negative emotion. If you’re feeling self-conscious about your frown lines, XEOMIN® may be the perfect solution for you. XEOMIN is a botulinum toxin A that works in much the same way as products like BOTOX® or Dysport® to smooth out wrinkles on the brow by reducing muscle movement. When you frown, squint, or smile, the muscles between your eyebrows contract and cause your skin to furrow. The resulting dynamic lines eventually contribute to persistent lines. As a neurotoxin, XEOMIN works by temporarily blocking signals between your nerves and muscles, causing the muscles to relax and minimizing their ability to contract. This allows lines and wrinkles to smooth out naturally when your face is at rest and prevents muscles from moving in a way that deepens creases. After your treatment, you should start noticing changes within 2-3 days, with optimal results showing within a week. Your XEOMIN results should last for 3-6 months. Am I a Good Candidate for XEOMIN? If you’re unsure what the best treatment option for you is, contact us today to schedule a consultation with Dr. Buford and his Physician Assistant Kaitlyn.